One of the first financial decisions you’ll make as a band is how much to charge for your gigs. And while I’d like to say that setting an appropriate price gets easier the more you play, the truth is it always feels a bit like haphazardly choosing a number and hoping people are willing to pay it, or lowballing yourself with a pay-what-you-can (PWYC) entry just get some people in the door in a weird city on tour. Usually, neither is ideal for you. Sometimes it’s up to the venue to set the ticket price, and you don’t really have a choice in the matter. But when it’s up to you to decide what the entry fee will be, how do you settle on a number you’re comfortable with? Here’s how to think about ticket price in relation to your band, your brand, and your gigging strategy. Is this a special show? Special performances (like album release parties, reunion shows, one-off collaborations, etc.) should typically call for a higher ticket charge. When the show marks a special occasion, people are willing and expecting to pay more. And to be honest, charging more actually helps people to understand that this is a “special” gig, especially if they’re used to seeing your band play locally for less. Add to the experience by including something extra with the higher ticket price. If you’re releasing an album, consider charging $10 for a regular price ticket, or $18 which includes a copy of the record at a slight discount. This can work for exclusive merch, too, or via a contest whereby the first 25 tickets sold come with a signed CD, a free poster, etc. If you’re putting on a special show, you want to, you know, make it special. That means giving your fans a little something extra wherever you can. Whether you’ve been playing together live for two months or 10 years should have an impact on how you set your prices. Bands that have very little proof that they can draw an audience willing to pay for their shows probably need to put in a few solid years of cheaper prices before they can justify charging more than $15 for tickets. But even if you’re new on the scene, if you’ve got promo power behind you and can fill a 200-capacity venue, a higher ticket price will help convince promoters and talent buyers to take you seriously. In most circumstances, the size of the venue matters less than your ability to sell out those rooms. Even if you’re playing smaller rooms, if you can fill them, you can up the price a bit. Who are the other bands on the bill? All of the above being said, if the other bands on the bill do have a strong history of pulling in fans, you’ll be able to factor that into your door price, too. The more fans you think you can collectively pull in, the more confidence you can have that charging a higher rate will still bring in enough people. Remember that the balance here is about achieving the most value for the price. Are you putting on the show or has someone hired you? When someone has hired you for a gig (whether it’s a corporate gig, a wedding, or another type of private event), the methodology behind how you set your price will be a little different. Instead of setting ticket prices, you need to come up with a decent hourly rate that makes the event worth your time. Keep in mind that most companies and organizations actually have a budget for events, so hired events are always a really wonderful source of revenue. They may not be as glamorous as your dream gig, but if they help you pay the bills so you can play more of the live shows you love, then go for it! This one comes with a grain of salt because the reality is that most bands aren’t actually making what they necessarily deserve based on all the time, energy, research, and development they put into their music. If you’re lucky enough, you’ll be able to cover your expenses and make money on top of that for every gig you play, but that takes a bit of time, so don’t get discouraged. However, it is important to consider your expenses on a gig-to-gig basis nonetheless (especially on tour) when figuring out what to charge at the door night after night. Things like your show history, the other bands on the bill, and the rarity of you playing in a particular city should all be taken into account. But you’ll also want to consider the cost of your travel and accommodations, how much (if anything) you’re paying your bandmates, and whether or not your record is selling in that live music market. Lastly, let’s take a moment to consider how you approach your gigging career. Do you grab every show that comes your way? Do you carefully consider the pros and cons of each gig? Or do you simply shy away from playing live unless you absolutely have to? Likewise, I can ask a similar question: Are you putting some thought into how much money you actually want to make from shows per month, and planning accordingly? If you want to make $200 a month from live gigs, how are you going to get there? If one gig a month can secure that for you after expenses, great! If not, you might want to try to book local shows more often, or consider playing less and consolidating those shows into a couple tours per year instead. It might mean putting in a bit of relationship-building work first if your network isn’t that strong yet, or you can work on it from the merch angle, by creating a larger range of products to sell to fans on any budget. Live gigs can actually be a pretty lucrative part of your music career, but haphazard show hopping will not lead to consistent live gig income. Set some goals based on where you see yourself in six months, one year, five years. We created this guide to answer a simple question: How do songwriters support themselves? The answer is not as simple as we’d like, but our goal is to make it as clear, transparent and understandable as we possibly can. Songtrust is more than just a rights management platform and publishing administrator - we’re a team of experts in the music community who strive to educate, support, and provide thought leadership to creators, representatives, and businesses across the music industry. 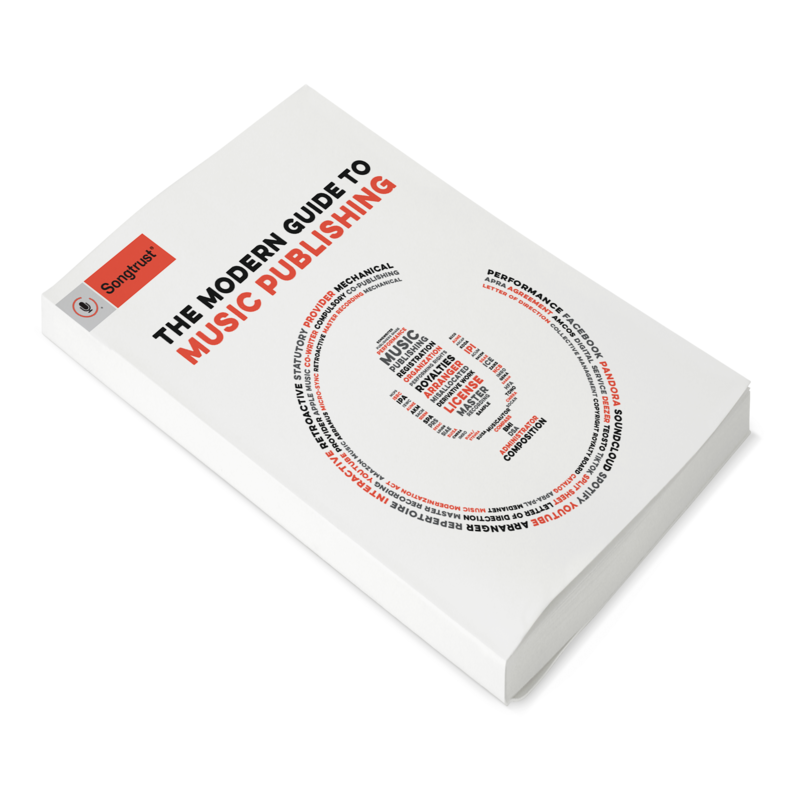 Our hope is that you’ll finish this guide with an better understanding of the business behind songwriting and have actionable resources to help you be successful. Included is an extensive glossary, too; if you see a term in bold in the text, you’ll find it in the glossary at the end.